If your little one is teething or just loves putting everything into his or her mouth (what baby doesn’t?) we know the struggle is real. That means no jewelry, scarves or anything unsafe that your little one might want to chew on. But wouldn’t it be nice if we could wear a little jewelry from time to time when out with your little bundle of joy? Well if you think teething necklaces don’t exist, think again. 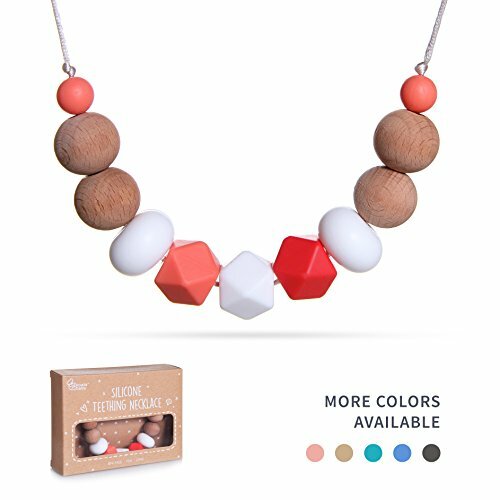 It’s real, it’s functional and we’ve got our top picks for the best teething necklace for mom that looks oh so cute and yet are oh so safe for your little one to munch on. What about amber necklaces for teething? Babies start teething right around 6 months to 12 months old. The first teeth that usually come in are the bottom front. The two main signs that your baby has started to teeth is they have become fussy and they are drooling… a lot! Teething is painful. Those little teeth breaking through gums isn’t fun, but there are some ways to ease the pain of teething including giving them teething rings or teething toys to chew on. Teething toys can be a great way to help your baby get through the pain of those teeth coming in. But a teething necklace that is worn by mom is also a great choice. Babies naturally want to grab for mama, so giving them something to grab that is also safe to chew on, will help not only ease teething pain but can be a fun tactile learning experience too. However, don’t let them chew on just any necklace. What makes teething necklaces so special? The beads are made of silicone. Whether food grade silicone or medical grade silicone, teething necklaces for moms are made of silicone because it’s safe, durable, easy to clean and typically don’t harbor any harmful bacteria. However, you’ll notice that a necklace on this list does feature beads that are not only silicone but wood too. Untreated wood is also safe for kids to chew on! The cord is strong. No thin strings here. Babies are surprisingly strong so teething necklaces are usually made of a durable cord. The clasp is a breakaway clasp. Babies can pull and yank and poor mom’s neck can take a beating. That’s why teething necklaces usually feature a clasp that easily breaks away if baby starts tugging too hard. We mentioned it before but teething necklaces aren’t just great for chewing on. They also promote something called tactile learning which is learning through touch. Learning through touch is extremely important for babies and not just for learning how to use their body, but also helps with cognitive, language, emotional and social skills too. Many moms choose to wear a teething necklace while nursing their child for those tactile learning benefits. Some moms swear by them. But do amber necklaces work to help alleviate teething pain? And more importantly, are they safe? Amber necklaces are made from Baltic Amber which is fossilized tree resin. So here’s the theory as to how amber necklaces work when babies wear them. Baby’s body heat helps release a very small amount of the oil in the amber which then absorbs into the babies skin and subsequently, their bloodstream. The oil contains something called succinic acid which is supposed to have an analgesic property that helps swollen painful gums. The problem with amber necklaces is they can pose a strangulation risk as well as, it the child puts it in their mouth, a choking risk. Today, many doctors strongly recommend mother’s do not put amber necklaces on their baby. So now that you know what makes a great teething necklace, let’s move on to our top choices for teething necklaces for you. While safety is the top priority, these teething necklace also look cute too! Check out which ones made our list! What girl doesn’t love a simple strand of pearls? And what baby doesn’t love munching on some soft but firm balls on a string? 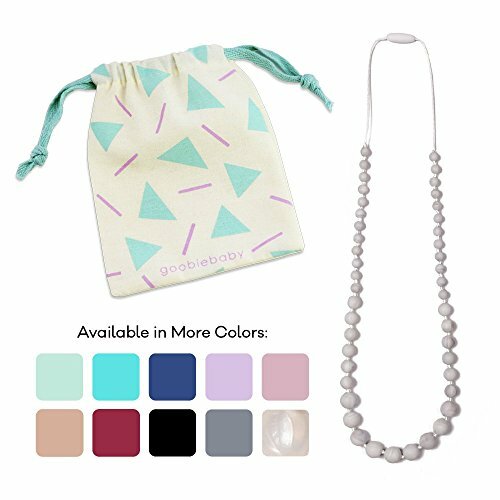 The Goobie Baby Audrey necklace has a 14-inch drop, a safe breakaway clasp and silicone beads that are safe for baby and cute on mom. Available in colors like white, black, rose quartz and turquoise, there’s a Goobie Baby for every outfit and taste. Great for breastfeeding babies who also want a little something to hold on to and touch while they feed. 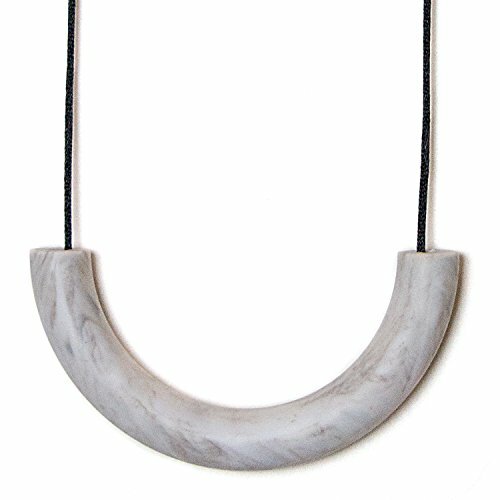 This necklace is BPA-, phthalate- and latex-free and is even dishwasher safe. 100% silicone is dishwasher safe. 14-inch drop is a perfect length. Little hairs and fuzzies stick to the silicone beads. 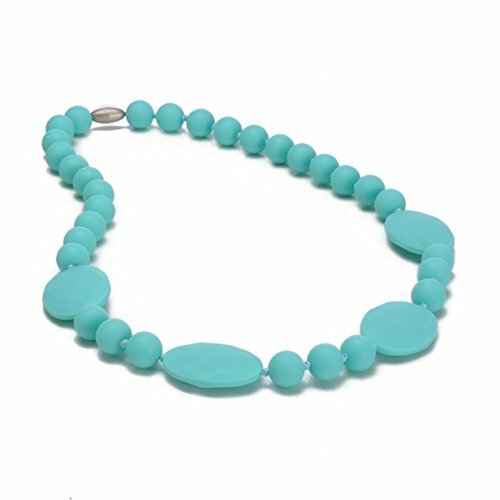 A little soft, a little squishy, a little hard… a variety of textured beads are on this necklace depending on what kind of firmness your little one wants to munch on today. This stylish necklace features a variety of beads, each with varying degrees of firmness. The beads are all made of a medical grade silicone and are latex and BPA-free. It has a 15-inch drop and is dishwasher and freezer safe. The clasp is durable but is also breakaway safe in case your child pulls a little too hard. Different firmness levels. Squishy, soft and hard. Stylish design with cool, complimentary colors. The two strands have a tendency to get tangled up. This is a chunky eye-catching piece, a lot of fun to wear and chew on. 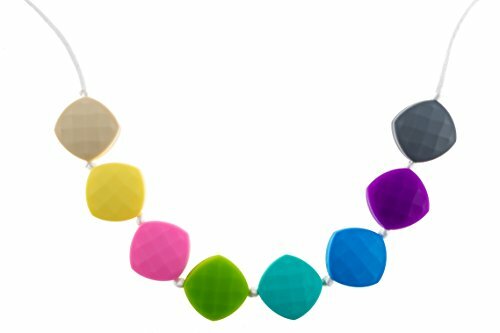 The Sweet Pea teething necklace features food-grade silicone beads that are cadmium-, BPA-, latex- and -free. The necklace is also resistant to bacteria and hypoallergenic. Super affordable, the Sweet Pea teething necklace is 28 inches total and the beads won’t pull on hair. The clasp is made of PVC and the cord can be easily cut to adjust to the desired length. Square textured beads are soft and durable. Free of cadmium, BPA, phthalates, latex or other harmful materials. Clasp stopped working after being broken away several times. If you are looking for some a little simpler, less on the chunky side, the Mama & Little Alexa necklace is a simple, modern with one single curved bead for babies to chew on. This necklace has a 14-inch drop and the curved bead is textured on the backside for extra relief for little ones. 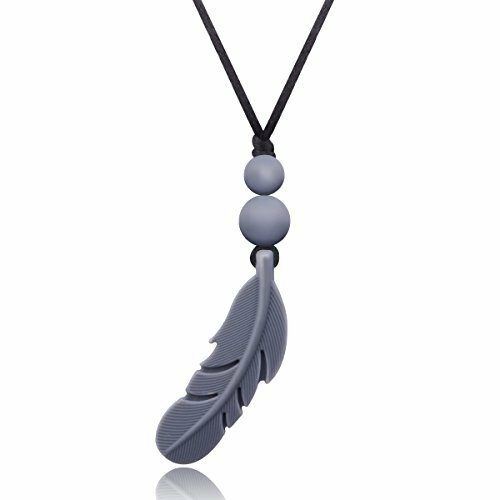 It is made of food-grade silicone and like the other necklaces on this list, features a breakaway clasp. One single teething bead is durable. Made of food-grade silicone that doesn’t harbor bacteria. Available in a limited amount of colors. We love that they come in solid colors. Your baby will love munching on the beads. This is another easy to clean (dishwasher safe!) necklace made from medical grade silicone that is BPA-, cadmium- and phthalate-free. If you are looking for something a little more colorful check out the vibrant chartreuse or bright turquoise options. Or if you prefer something more classic there is black. In total, there are 10 colors to choose from which ensures there are is something for every mom and every style. It has a little over a 14-inch drop. The only downside is the slightly higher price tag, but between the style and the function, you’ll probably have no issue spending a little more. 10 fun colors to choose from. Here’s another funky little option that comes in two style options: Spicy Mocha and Monochrome Pebbles. The food grade silicone beads on this necklace will stay free of bacteria, mold and won’t absorb any odors. Also on the Spicy Mocha option, the necklace features wood beads that are untreated and safe for baby to chew on. 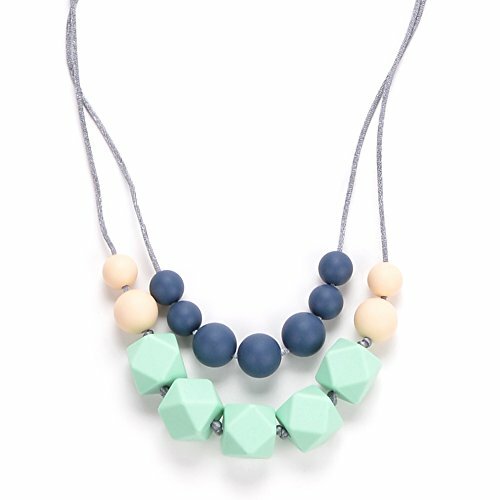 This budget-friendly necklace is not only safe but stylish for any mom with a baby who is in the throes of teething. A mix of silicone and wood beads for different textures. May need to oil wood beads occasionally if they dry out. 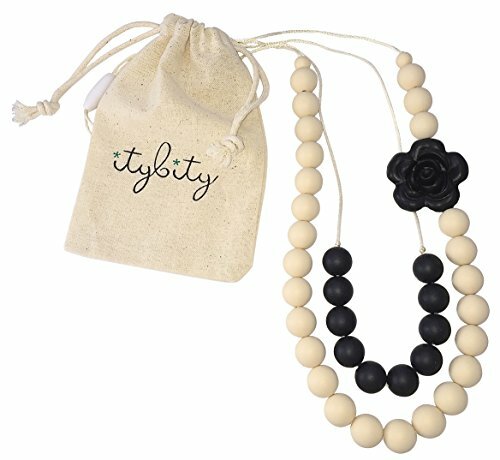 For more of a statement, the ItyBity teething necklace will give your child plenty to chew on from the double strands of silicone beads or the silicone flower accent on the side. No matter what he or she chews, it’s super safe and free from any harmful chemicals or materials. This necklace is dishwasher safe and is made of a food grade silicone. Available in three colors including black & white, black & cream, and mint & grey. Safety knots are located at the tops of the beads and it also has a breakaway clasp for safety. Bold stylish necklace with fun flower accent. Plenty of beads to chew on! The two strands of beads tend to get tangled up. The Megoday Teething Necklace is a trendy option for moms looking to wear something other than chunky necklaces. The simple feather is perfect for your little one to grab on to and chew, but also looks cute on you! The BPA- and phthalate-free silicone is safe and fun for kids to chew on and the bumps of the design help soothe those aching gums. It is available in grey, greyish white, pink and green. This necklace has a 15-inch length, a strong cord, and a breakaway clasp. It is also freezer and dishwasher safe too! Some babies gag on the long feather if shoved in their mouth too far. Q: How do I clean my teething necklace? A: Many of the teething necklaces are dishwasher safe. But check with the manufacturer’s instructions first. When in doubt, wash the necklace with water and a gentle soap. Q: Can I put the necklace in the fridge or freezer? A: Again, check the manufacturer’s instructions first, but yes, most are safe to put in the fridge or freezer for a little extra relief. Q: Are wooden beads safe for my baby to chew on? A: Yes! Teething toys can be made of rubber, silicone or wood. You’ll notice that one of the necklaces on our list features wooden beads. These beads are not treated. The only thing you should do if the beads get dried out is to apply a little oil on them to moisturize the wood. Whether for teething or tactile learning, a teething necklace for mom is a great way to not only help alleviate some of the pain for baby that comes along with teething but to also great fun for them to learn through touch. The Goobie Baby “Pearl” necklace is a great pick. It has a simple design and comes in a variety of colors that you won’t mind wearing and are safe for baby to chew on.